After you customize the signup form for your audience, you're ready to start collecting subscribers. A simple way to promote your audience is to share your signup form to social media and other communication channels. All Mailchimp forms are mobile responsive, so potential subscribers can sign up from any device. In this article, you'll learn how to copy and paste your signup form URL to share on social media, your website, or anywhere else you can add a link. These built-in share options send potential subscribers to the Mailchimp-hosted signup form. You can also host your own custom signup form. Each signup form URL is randomly generated for your specific audience and can't be customized. In the Form Builder, you'll see a Signup form URL field along with three icons for built-in sharing methods: Facebook, Twitter, and QR code. The URL is a direct link to your hosted signup form. Depending on your needs, you may want to embed a signup form on your Facebook Page or just share a link to your form in a Timeline post. 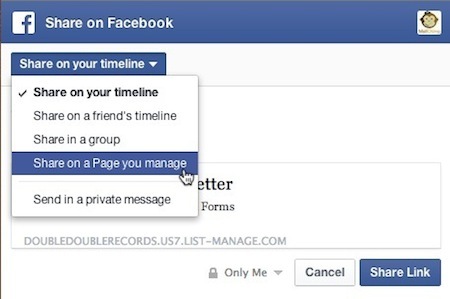 To embed your form, you'll need to set up the Facebook integration. 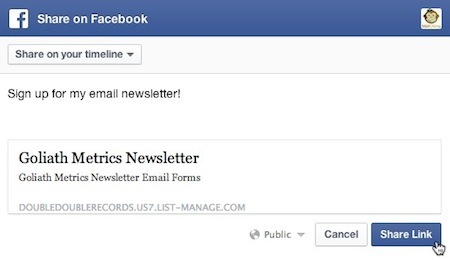 To share your signup form link in a Facebook post, follow these steps. Navigate to the form builder. If you're not already signed into Facebook, you'll be prompted to log in. In the Facebook pop-up modal, click the drop-down menu and choose on which page you want to post the signup form link. Type in additional text to share in the post and click Share Link. The link to your signup form will appear as a Timeline post. If you have Twitter followers who might want to receive your email content, you can tweet a link to your signup form. To share the link to your signup form in a tweet, follow these steps. If you're not already signed into Twitter, you'll be prompted to log in. In the Twitter window or pop-up modal, type in additional text to appear with the shortened link. Marketers sometimes use QR codes instead of a text URL to send people to a website. 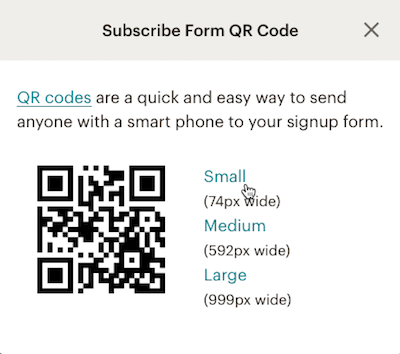 Mailchimp generates a QR code for each of your signup forms, so you can display a QR code in your printed materials. Potential subscribers can use their mobile devices to scan the code and view your signup form. To access the QR code, follow these steps. Click the QR code icon. In the pop-up modal, click Small, Medium, or Large to choose the size of image you want to download. If your QR code doesn't download automatically, right-click or CTRL+click the image, and save it to your computer. Place the image file in your printed materials. To share a signup form in a campaign, add a link in your campaign content using the *|LIST:SUBSCRIBE|* merge tag in place of a click-through URL. When you send your campaign, Mailchimp will replace the *|LIST:SUBSCRIBE|* merge tag with the signup form URL. Any time someone receives a forwarded campaign or views your campaign in their browser, they'll be able to sign up to your email marketing. We provide HTML code for a signup form that can be customized and embedded on your website. Choose which type of form best fits your needs: Classic, Condensed, Horizontal, or Unstyled. Then copy and paste the code into your website's HTML, wherever you want the signup form to appear. There are several ways to add a Mailchimp signup form to your WordPress site. Learn which signup form works best with your site.